Guidebook research may sound like a dream job, but mostly it's grueling hard work pounding the pavement. So who can blame a road-weary travel writer for doing a fair amount of extra in-depth research at local brewpubs? After all, brewpubs - breweries with an onsite pub - are a window into a local culture and often have links to a town's past - and, by the way, they also serve beer. For Lonely Planet's latest USA guidebook, we had 26 authors crawling across the country looking for the best travel experiences the country has to offer, which translates to a fair number of beers sampled at some of the country's finest local craft beer makers. It's thankless toil, but it's our duty to readers to be thorough. Gritty McDuff’s - Portland, ME. This Old Port brewpub has it all: harbor views, high energy, good pub grub and award-winning ales. Order up a robust pint of Black Fly stout and join the crowd. Magic Hat Brewery - Burlington, VT. This insanely popular brewery, off US 7, offers free tours of its brew operation – and of course they’ll tip the tap to let you sample the art. Perhaps the coolest brewery you’ll ever see. Nodding Head Brewery - Philadelphia, PA. Home of hearty brews and many, many bobble heads lining the walls. After a few of the house beers, you might find yourself nodding as well...in agreement that this is a brewpub worth seeking out. Church Brew Works - Pittsburgh, PA. Serves handcrafted beers and cuisine that goes well beyond your typical pub grub in a massive former church space; a standout in Lawrenceville. Bell's Brewing - Kalamazoo, MI. Michigan's first brewery with a pub, Bell's beers are now found in bottles throughout the region but the beers taste best on tap at the Kalamazoo original. Undergoing renovations in early 2011 to expand the restaurant and open a new venue for live acts. New Holland Brewing Company - Holland, MI. A big player in the American craft beer movement, the home base of New Holland has 12 rotating beers on tap, plus a range of bottled beers and harder stuff, if you're so inclined. Pub food and a variety of specialty pizzas are there to help you sample the wares. Goose Island Brewery - Chicago, IL. Goose Island’s pub pours the flagship Honker’s Ale and 14 or so other potent brews. If you’re lucky, the 10% Extra Naughty Goose or Maple Bacon Stout, served with a meaty slice, will be on tap. Tours take place on Sundays and must be reserved in advance. Fine grub complements the brews; special kudos to the Stilton burger and chips. Great Lakes Brewing Company - Cleveland, OH. Great Lakes wins numerous prizes for its brewed-on-the-premises beers. Added historical bonus: Eliott Ness got into a shootout with criminals here; ask the bartender to show you the bullet holes. Summit Brewing Company - St Paul, MN. No restaurant, but offers free brewery tours three days a week that will give you a chance to see the process and sample the results (book in advance, especially for the popular weekend tours). 3 Floyds - Munster, IN. Not far down the road from Chicago, 3 Floyds is devoted to small-batch craft beers, serving fresh foods supported by their own organic herb and vegetable garden, and naming their beers quirky things like 'Apocalypse Cow'. Free State Brewing - Lawrence, KS. One of many good places on Mass downtown, this is the first brewery in Kansas since Carrie Nation got one closed in 1880. A cut above brew-pub standards, the beers are excellent. The food is much-loved as well, leaning towards cheesy thirst-inducing classics. Schlafly Brewery - St. Louis, MO. This sign in the window speaks well of the bar; the oldest and largest locally-owned St Louis brewery produces over 40 superb styles of beer through the year including an excellent dry-hopped APA (American pale ale). Live Oak Brewery - Austin, TX. Available on tap around Texas, take a free and lively tour at the brewery followed up with samples of the six house-crafted beers. Beaver Street Brewery - Flagstaff, AZ. Beaver Street Brewery is a bustling place to go for a bite to eat with a pint of local microbrew. It usually has five handmade beers on tap and some seasonal brews. The menu is typical brewpub fare, with delicious pizzas, burgers and salads. Surprisingly, it’s very family friendly. Sierra Nevada Brewery - Chico, CA. At the Sierra Nevada Brewery, this place is a genuine Chico destination. It has better than average pub food; fresh, superb ales; and lagers on tap, some not available anywhere else. The apple-malt pork loin is a standout. North Coast Brewing Company - Fort Bragg, CA. If you're driving through Mendocino’s scrappy sister city, Fort Bragg, the elegant and well-balanced brews at North Coast Brewing Co are reason enough to pull over. Auburn Alehouse - Auburn, CA. You'll find eight beers plus some guests at this atmospheric Gold Country brewpub in Auburn's historic Old Town, ranging from some easy-drinking session beers to an Imperial IPA for hop lovers. Bridgeport Brewpub - Portland, OR. This huge, relaxing unpretentious bar (which also sells great food) hides a small piece of history. This is where the micro-brewing industry in the US was kick-started in 1984. And yes, it’s still here working the magic. Pike Pub & Brewery - Seattle, WA. Leading the way in the microbrewery revolution, this brewpub opened in 1989 underneath Pike Place Market. Today it still serves great burgers and brews in a neo-industrial multilevel space that is a beer nerd’s heaven. Haines Brewing Company - Haines, AK. It’s well worth the walk to the delightful one-room brewery serving up seven house beers in Haines, home of Great Alaska Craft Beer Festival. 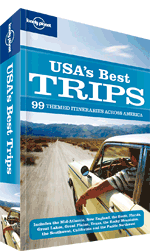 99 themed trips across the USA - including some just about beer - are all packed into Lonely Planet's top-selling American trip companion, USA's Best Trips.